When I worked outside the home full time before having kiddos, I remember thinking that Fridays wouldn't be as exciting. It turns out, I was wrong. I am always excited to see Friday roll around. 1. This week has been straight up weird. I'm not even sure how to explain it. 2. I feel like the last person on the planet to fall head over heels for Fixer Upper, but it finally happened. I now understand the Farmhouse craze in home decor. 3. 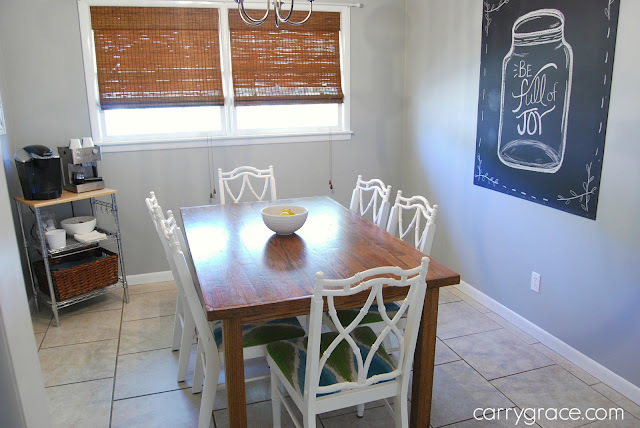 I shared the changes I made to our dining room during Week 3 of the A Bowl Full of Lemons Home Organization 101 Challenge. I came across 2, new to me, really old chairs that now have my dining room back in limbo again. Story Of My Life. 4. This week I shared my January Favorites on my YouTube Channel. I may or may not have went on and on about Fixer Upper. Is it obvious we went to the library for new books? 5. I decided that instead of doing a whole post and link up for my #carrygrace52wkphotochallenge I am going to include the photo in my Friday Favorites post with no link up. It's no fun to party alone. Love your coffee station! I have tried so hard to find a spot in my kitchen for something like that, but I just don't think it will happen in this house. Enjoy yours! LOVE how your dining room looks. What a great space! And I only just discovered Fixer Upper too, but isn't it the cutest show? I binged watched it quick on Netflix and I'm hooked. Hope you're having a great weekend! !